After getting back to Miami from New York, I was craving some home cooked food. Don’t get me wrong, I love going out to eat, but after a while I just start to crave something hearty, healthy, and homemade…and that describes Alton Brown’s garden vegetable soup perfectly. I have made this soup three or four times already and it is always delicious, although I do make some very minor modifications. The recipe below is my version, although you can find the original on the link at the bottom. Enjoy! Heat the olive oil in large, heavy-bottomed stockpot over medium-low heat. Once hot, add the leeks, garlic, and a pinch of salt and sweat until they begin to soften, approximately 7 to 8 minutes. Add the carrots, potatoes, and green beans and continue to cook for 4 to 5 more minutes, stirring occasionally. Add the stock, increase the heat to high, and bring to a simmer. Once simmering, add the tomatoes, mushrooms, and pepper. 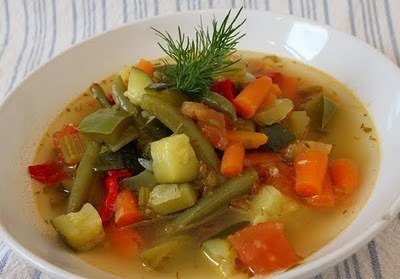 Reduce the heat to low, cover, and cook until the vegetables are fork tender, approximately 25 to 30 minutes. Add the frozen peas and cook for 2 more minutes. Remove from heat and add the lemon juice. Season, to taste, with kosher salt. Serve immediately. ***I serve mine over ditalini pasta! CHECK OUT THE ORIGINAL RECIPE!